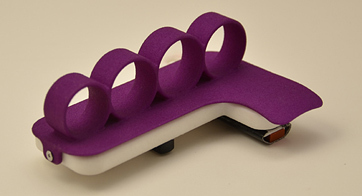 Capo Clips - Express your own original voice with amazing new sounds! Cute little clips that fit under a capo and create and alternate tuning sound without having to change your tuning. 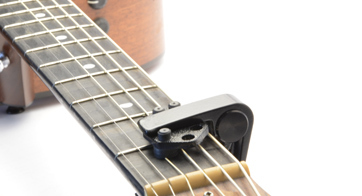 Capo clips give you a powerful alternate tuning sound without having to re-tune your guitar, Capo clips attach with our specially designed spring clamp capo or many commonly known capos including Dunlop, Daddario's, and Kysers. Capo Clips put the guitar in different keys and changes the way it resonates without having to physically change tunings like you would with an alternate tuning so you can get that rich alternate tuning sound without having to relearn new chords or riffs, just clamp it on and play using what you already know. Featured in Guitar Player and Acoustic Guitar Magazines! 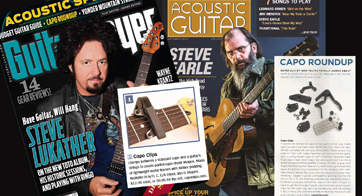 Read what the pros have to say about Capo Clips. Hand Chord lets you emulate classic bar chords used in thousands of songs. You play full bar chords without even touching the strings. Please watch the video for more info. It takes away the pain and frustration, no more hurting fingers just a soft cushy rubber feel. It's also a shortcut for people who don't have the time to learn guitar and can also be a gateway for people learning guitar to help them concentrate on strumming and getting a feel for playing without months of practice. Watch 6 players with various styles using different Capo Clips. This video will show you some of the countless variations that are possible using the Hand Chord. See the D Capo Clip in action as Scott Stenten plays his song titled "Huricane".